After a long, snowy winter for much of the country, Spring/Summer is finally here! We are starting to enjoy the great weather and excited for the school year to end. This time of year also has another cause for celebration, my son's birthday. Each year I through a HUGE party for him. I make decor, invites, paint photo props, organize games you name it! This year we have been completely remodeling our basement and the house projects have taken a toll on us. Not just physically, economically but also these projects have consumed much of our time. Time to plan, create and organize a HUGE party we have done in the past. This year I asked him if we could take the stress out of his party by NOT making everything. 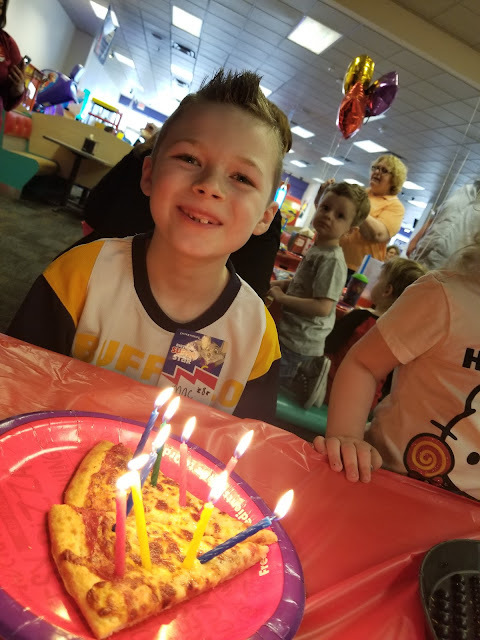 By hosting his party at Chuck E. Cheese I was able to have a stress free party because they took care of everything! Just make your reservations online or at your local store. Add what you want and how many guests will be attending. When you arrive you will be showed to your seating area and given your Powered by Play Pass. 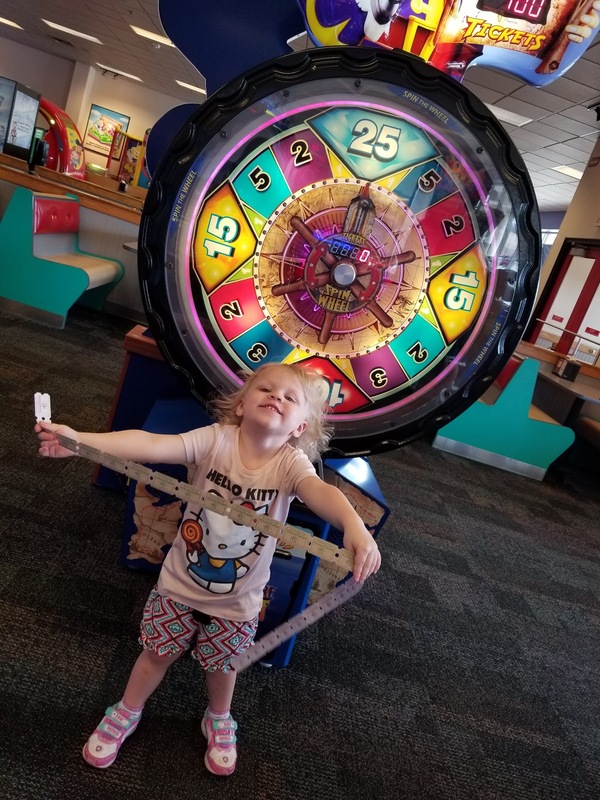 Simply tap the card on the machines to play your favorite kids games! Each package comes with different Play card amount options. During our game time Chuck E came out to sing, dance and play. My son knew all the words and at the end they threw FREE tickets to all the kids! By reserving a VIP Party on Saturday or Sunday you get the whole party area to yourself before the restaurant opens, for one hour! We could not make it quite THAT early so we did share the area. I will say I would plan for the earlier slot because this area can get filled quickly with parties, guests, kids and staff! They have new cake options including: Chuck E., Batman, Barbie, Paw Patrol or Ice cream, Dippin’ dots and Giant Warm Chocolate Chip Cookies. My son has a suger intolerance so we opted for a Pizza "Cake". 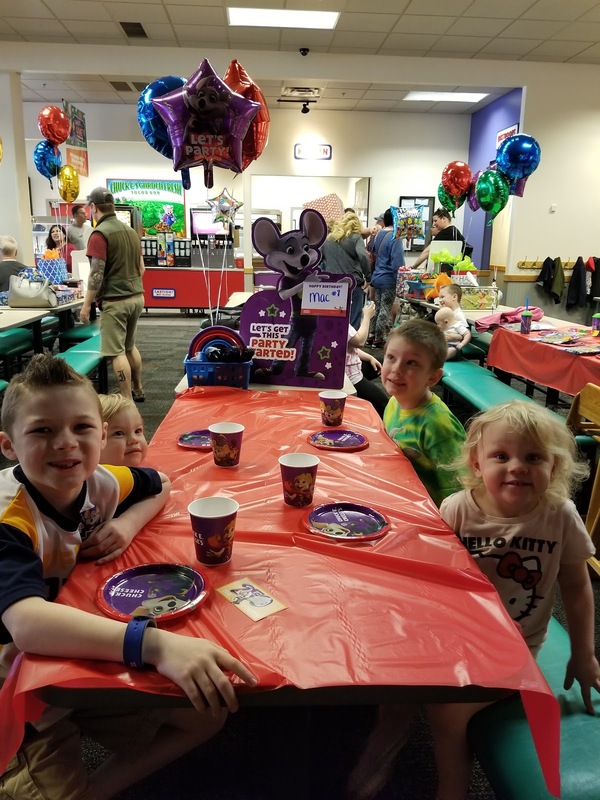 At Chuck E. Cheese’s they helped set up EVERYTHING for his birthday party, from goody bags, balloons to cakes, drinks and candles on his pizza! We just had to bring ourselves and they took care of the rest. It was by far the easiest party I have ever "hosted" for him. We stayed for around 2 hours just to give you an idea on planning. Overall the kids had so much fun. They each picked out takeaways with their tickets, had full bellies and are still talking about it! 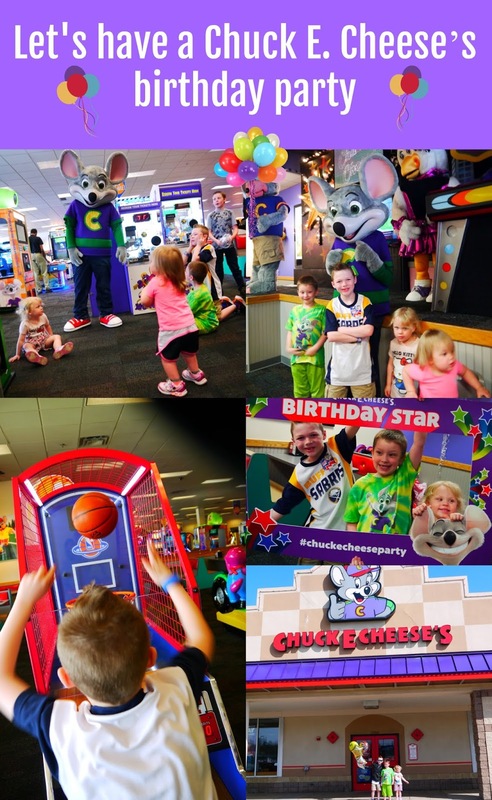 Have you ever hosted or been to Chuck E. Cheese? Favorite Chuck E. Cheese Memory?? This is a sponsored conversation written by me on behalf of Chuck E. Cheese's. The opinions and text are all mine. I had my first birthday party at Chucky Cheese. I loved it as a kid. Now that I am a parent I take my own daughters occasionally. Wow! This type of birthday will surely be memorable and remarkable to every kids and kids at heart. A dream come true for every parents too. This looks like so much fun! Kids love getting together and playing games! It looks like the party was so much fun! When I was younger and would go for parties I remember having a blast. I can't wait to be able to take my son once he's a bit older. Thanks for sharing! It looks like a lot of fun to have a party at Chuck-E-Cheese. This is definitely a great idea for a little ones party. Always a great choice for a child's birthday party. My children had their birthday parties there almost every year! Kids are entertained plus the food is great equals an awesome party.